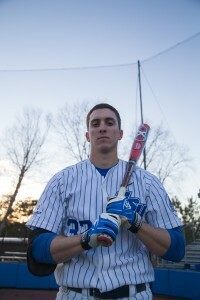 Fifth-year senior outfielder Chase Raffield holds to the motto “It’s not how you start, it’s how you finish” as he finishes his collegiate career after a devastating knee injury. Raffield had a decorated high school baseball career at Bleckley County High School (Cochran, Ga.). He was a four-year letterwinner, named 2008 and 2009 Offensive Player of the Year and 2009 1st-team all-region, before signing to Gordon College (now-Gordon State College in Barnesville, Ga.) in 2009. Raffield set multiple single season records in his freshman season at Gordon with most games played (61), doubles (23) and runs scored (83). He also led his team to the 2010 Region XVII title and was named the tournament’s most valuable player by the Georgia Junior College Athletic Association (GJCAA). However, in his second year at Gordon in 2010, Raffield suffered a career-altering injury. Raffield suffered the injury while chasing a fly ball in practice, just seven games into the season, according to The Daily Sentinel. “I couldn’t even walk, and I had to be in a wheelchair for a while,” Raffield said. Raffield redshirted the following season due to the devastating injury and only played in 11 games in his final season (2012) at Gordon after injuring his knee again. However, the Raffield’s faith in God and dedication to rehabilitating his knee gave him another chance at playing baseball. “God gave me the strength to rehabilitate and get back on the field,” Raffield said. Suffering two season-ending injuries while playing at a junior college would end the chances of most athletes in transferring to a Division-I program. However, one school took a chance on Raffield: Georgia State. Coach Frady said it says a lot about Raffield’s character to overcome the injury he had—not only injuring it once, but reinjuring it again. “He did so much very difficult rehab work to get his knee back, and so when he got his knee back, he started to come back to form last year,” Frady continued. Last season turned out to be a comeback year for Raffield, since it was his first full season of playing baseball since his knee injuries. 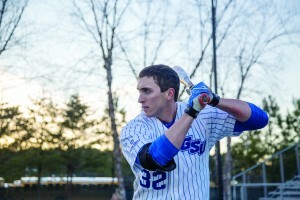 Raffield became Georgia State’s top power hitter and run-producer. Last season, Raffield led the team in home runs (10), RBIs (51) and slugging percentage (.645). This past off-season marked the first time the Cochran, Ga. native worked on his game instead of rehabbing an injury. “His development from last year to this year––the knee brace is off now, he’s playing and running faster, he’s kind of freed up as an athlete, he’s really returning to the strength and the speed he had prior to hurting his knee and we all been very impressed with that,” Frady said. Raffield said he worked on his hitting, speed and defensive skills since he’s making the transition from being a designated hitter last season to playing right field this season. Last month, Raffield was picked as a preseason All-American choice by the National Collegiate Baseball Writers Association (NCBWA) as their third-term designated hitter. However, Raffield wasn’t over enthusiastic by the recognition since he is focused on the upcoming season. “I think it’s a great honor. Of course, it doesn’t mean too much because the season hasn’t come yet and I still have a lot to prove,” Raffield said. Coach Frady, on the other hand, thinks Raffield being recognized as an All-American is well deserved. Frady said a lotstands out about the fifth-year senior, such as him being a good person, a great team leader, a very hard worker and a determined passionate player who gives 100 percent all of the time. As Raffield enters his last season at Georgia State, the Panthers will make their return to competing in the Sun Belt in baseball after a 20-year absence. The fifth-year said his outlook for the upcoming season is to play well and glorify God. “I want to be remembered for a God-fearing man who plays baseball for himself, his teammates, for the Lord, a great hitter, a great competitor and a good leader,” Raffield said.